Drop in throughout the day to enjoy some games, winter crafts, and movies (10:00 AM and 3:30 PM), or come to one of our scheduled programs. The New York State Department of Environmental Conservation is inviting quotes on 128 acres available for crop production at Tonawanda Wildlife Management Area, located within Niagara, Genesee, and Orleans Counties. Anyone interested in submitting a quote is required to attend a pre-bid meeting to be held February 22nd at 10 A.M. at the Iroquois National Wildlife Refuge Headquarters, 1101 Casey Road, Basom, NY. All relevant materials will be distributed at the pre-bid meeting, and a site-walk through will follow the meeting. Anyone unable to attend the pre-bid meeting must contact Biologist Heidi Kennedy via email at heidi.kennedy@dec.ny.gov, at (585) 948-5182, or in writing at the address given below to make alternate meeting arrangements as soon as possible. Please also reply to the above email or phone number if you do plan to attend the pre-bid meeting. 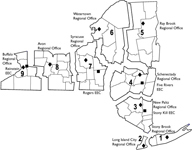 Sealed bids will be received by the New York State Department of Environmental Conservation at the Region 8 Iroquois Field Office, 1101 Casey Road, Box B, Basom, NY 14013 until 1:00 P.M. local time on March 14, 2019 at which time they will be opened and read and the contract awarded as soon as possible for a three-year lease, with two possible one-year extensions, of 128 crop acres on 4 (four) fields recently in agriculture located within the Wildlife Management Area, owned by the State of New York. Bids shall be submitted in a sealed envelope marked "Tonawanda WMA". Each bid must contain the full name of every person or company interested in same. No bid shall be withdrawn for a period of sixty (60) days after being opened and read. 12/28/18, Winter Wildlife - Look for signs of who is out and about in the winter woods, and discover how animals survive the cold. Registration required; call 716-683-5959. 2/22/19, Snowshoe Walk - Join us for a morning snowshoe walk along the trails as we look for signs of wildlife. Snowshoe rental: $5/$2 for Friends members. Registration required; call 716-683-5959. In the winter we can put on more layers, have some hot chocolate, and sit by a nice fire to stay warm. But what about wildlife? How do they stay warm and make it through the toughest part of the year? Join our naturalists around a campfire to learn about the amazing ways wildlife survives in the harsh winter months. Join us by the fire for tantalizing tales as you roast a hot dog and sip hot chocolate. There is a small fee for the food.